This article was originally posted ﻿here. RETIRING in Penang was an easy decision for Japanese nationality Kazunori Koga, 65. It came as no surprise to him when George Town was picked as the sixth ‘Best place to retire abroad in 2016’ by CNN Money. For Koga, who has been living in Malaysia since last May, George Town has much to offer in terms of heritage, nature and hospitality. “My wife and I first lived in Kuala Lumpur for six weeks but the pollution was too much. Our friends then recommended we take a trip to Penang. We did it and instantly fell in love with the place. “You can say it was love at first sight,” he joked when met at his apartment in Gurney Drive recently. 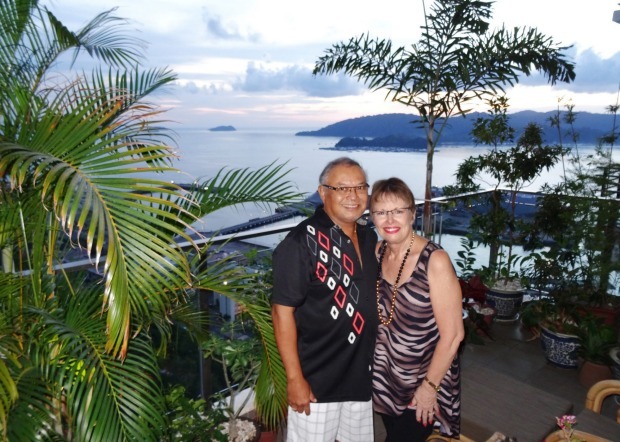 With his French wife Caroline, 60, Koga plans to fully utilise their Malaysia My Second Home (MM2H) visa, which lasts for 10 years. He had also written a book in Japanese about his visits to 81 countries, and said Penang was one-of-a-kind. Another pair of foreign retirees, British citizen R. Jayaram, 68, and his wife have made Penang their home for the last 11 years. “The growing community of hashing, among other things, are some of the things I love about life here,” he said. The former manager of an airline catering company said Penang had some of the best places for trekking, naming Penang Botanic Gardens and Penang Hill as his favourites. Supporting groups like Coconut Club have helped many foreign retirees to settle down here. Its branch manager Yukiko Hashizume said the biggest problem for most foreigners is the language barrier. “We cater mostly to the Japanese and help them with housing arrangements, banking and registering their children into schools,” she said. Hashizume said the club, which has been in existence for 15 years, currently has more than 400 active members. On Jan 6, a CNN Money report by Katie Lobosco dubbed the northern state as the sixth best spot out of 10 to retire this year. The list’s top five were Algarve (Portugal), Cayo (Belize), Medellin (Colombia), Pau (France) and Abruzzo (Italy). Penang's first museum-themed cafe will officially open on March 1 at Jalan Bayan Lepas in George Town, Penang. Muzium Kafe is a family business owned by One Glory SA Venture registered under the Companies Commission of Malaysia. It is a combination of a restaurant and a museum. Each section of the café introduces its own category of Malaysian history, which includes the sultans, heroes of Malaya, the prime ministers and a special room known as "Bilik Diraja" for VIPs. Muzium Kafe owner Mohamad Shafiq Amin Arif said not many people understood the concept and he wanted them to learn and appreciate Malaysian history in a relaxing and enjoyable way. "The main idea of opening a museum café like this is to educate the people of Malaysia, especially the youngsters, on the history of our sultans and rulers of Malaya so that they will have a better understanding of the history as well as respect for the royal institution. "We want the people to enjoy learning the history of our country as well as to enjoy the leisure services we offer," he said. – Bernama, February 19, 2016.
of late, but many others around the region are also rolling out technologies to improve the quality of services that are delivered to its residents. In Penang, an application known as e-Peta now provides actionable information on areas such as land use, businesses, traffic and public transport to decision makers. This information is invaluable for timely mobilisation of resources to areas of need, while providing a clear picture of the ground for supporting social development projects. Developed in 2014 by the Penang Geographic Information Centre (PEGIS), e-Peta integrates data from various government departments, which can be displayed as layers on a dynamic map. These algorithms are made possible by the location technologies provided by geospatial information firm Esri Malaysia. e-Peta’s versatility is seen in its wide application by both the government and community advocates. Its Town Planning & Development Department, Penang Island City Council and Seberang Perai Municipal Council have combined e-Peta and GIS to design sustainable structural layouts in the city. Pusat Urus Zakat, an alms collection organisation, has also worked with Penang Women’s Development Corporation to map out the various locations of childcare centres in the state. e-Peta has seen an increase in users since its launch, with 26,559 log-ins alone during 2015. Currently, 90 per cent of e-Peta users are public servants employed by the Malaysian Federal Government or Penang State agencies, but there are plans for more members of the public to contribute to this database. “What made e-Peta so successful and interesting is its collaborative nature. When you make it easier for stakeholders to engage with one another and share data, it not only improves organisational productivity and efficiency, but it also helps facilitate the creation of next-generation services,” said Lai Chee Siew, CEO of Esri Malaysia. The collaborative aspect of smart mapping is essential to its success, for more possible use cases can be imagined with a larger amount of data and brains behind them. Singapore is off to a good start as well, with its OneMap and data.gov.sg portals providing rich amounts of government data that can be visualized in multiple ways in layers, much like e-Peta. Such data is also available in the form of an open source Application Program Interface (API), for use by developers to re-package and deliver relevant information. The next step, perhaps, is to allow non-governmental bodies with the expertise to contribute to the pool of raw data, such as what Pusat Urus Zakat and Penang Women’s Development Corporation has done in asset mapping the community in Penang. The Soap Cellar: Everything You Need For Your Skin And Made In Penang! This article was originally posted here..﻿﻿. GEORGE TOWN, Feb 21 — A strawberry cake. A Yule log cake. Lollipops. Cupcakes and slices of colourful cakes on a wooden counter, filling the whole space with the delicious fragrance of berries, vanilla and something unmistakably sweet. Unfortunately, these sweet-smelling “desserts” are not edible because they are actually handmade soaps crafted by Penang couple Daniel Khoo and Candy Chan. Fancy some soapy cake...these are handcrafted soaps for special occasions.Khoo and Chan started dabbling in soap-making as a past-time several years ago when they used to give the soaps out to friends and relatives as gifts. Due to the popularity of their soaps, they decided to make more and sell. They set up a small shop in Tanjung Bungah here, filling only a few small shelves with handmade soaps as a start and before long, The Soap Cellar, has become an exclusive handmade soap and skincare product supplier to hotels, companies and customers from all over the world through their website and shop. The Soap Cellar started out small but before long, it now has a full range of skincare and hair care products along with raw materials.Today, the couple has two soap-making companies; one is The Soap Cellar which is their retail shop and another, Global Organics Personal Care, which is the supplier for hotels and corporations. “We also custom-make skincare products such as soaps, creams and lotions as door gifts for corporate events, weddings and parties,” Chan said. The rare African black soap that is good for sensitive skin (left). Chan mixing up a batch of soap to be poured into the mould (right).The Soap Cellar today not only sells specialty soaps but also a full range of skincare from facial wash to lotions, creams, clay masks and bath salts, all personally mixed and made by both Chan and Khoo. Khoo, who grew up in England, imported most of the certified natural ingredients for all his products from England. Though they have the usual scented glycerin soaps, The Soap Cellar is particularly known for their shea butter-based soaps and products. The making of raspberry-shaped soap.The shea butter soaps are available in a dizzying array of natural scents from decadent mulled wine to delicious rich chocolate mint to the refreshing bright scent of olives or eucalyptus. Shea butter is a rich moisturising ingredient used in body lotions to moisturise and soften the skin so soaps made using it as one of the main ingredients means luxuriously smooth soaps that are moisturising, aromatic and gentle on the skin. The shop has over 50 different types of these shea butter handmade soaps. They also have pet shampoo (left). A fragrant lavender pillow mist for better sleep and insect repellent, also mixed by Khoo and Chan (right).“One of our specialty soaps that is hard to find in Malaysia is the organic African black soap made with organic Shea butter with organic virgin coconut oil,” Khoo said. The soap may look like a mottled brown lump but due to its ingredients, it is very rich and moisturising which Khoo claims is beneficial for those with sensitive skin issues such as eczema. As for their skincare range, they are particularly known for their varied choices of facial clays, particularly their French Green Clay and the Ghassoul Clay, both also hard to find in Malaysia. Lollipop soaps that smell as good as they look.Now, the shop also caters to fellow hobbyists who want to make their own soaps, creams and lotions by providing the basic ingredients needed. “We will also teach them how to mix the ingredients to make their own lotions and creams according to their needs,” they said. The special corner set aside for a teenage soapmaker to sell her handmade soaps.They also sell glycerin and goats’ milk soap bases so those who want to make their own soaps can also purchase the bases along with the fragrances from them. In fact, the shop even has a small corner for a teenage soap maker to sell her handmade soaps. Even though most of the ingredients used in their products are imported from England, one of the main draws of The Soap Cellar is their competitive pricing. “We don’t believe in charging sky high prices for quality skincare products,” Khoo said. The range of products that the shop carries includes essential oils, hair care, baby care and even pet shampoo. GEORGE TOWN: A drastic increase in rentals has forced 34 tenants to move out of the 55 pre-war properties along Penang Road, Kimberley Steet and Lim Chwee Leong Road. The rentals have increased dramatically by 100% to 700% since Jan 1 when the new rates took effect. Some of the monthly rentals have gone up to RM14,000 from RM2,000 (up by 700%), while others have increased to RM2,000 from RM700 (up by 285%). “As a result, many of them have closed their businesses and moved out, leaving only 21 of the pre-war properties still occupied. 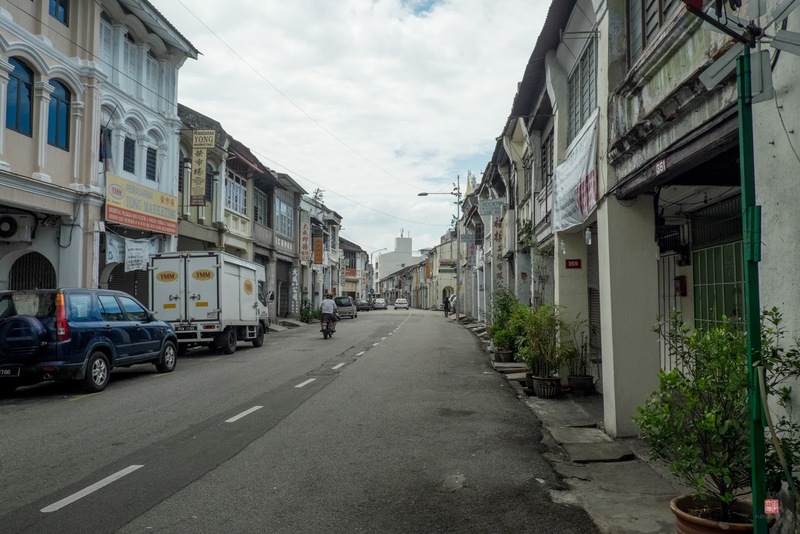 “About 50% of the tenants are involved in old trades that are responsible for the city getting listed as a Unesco World Heritage site,” George Town Heritage Action co-founder Mark Lay said in an interview yesterday. Lay said over the past two years, the rentals in the heart of George Town have increased significantly, forcing those who could not afford them to relocate to the suburbs. “The state government should intervene in the matter as maintaining the status of old trades in the heritage zone is the criteria for getting the Unesco World Heritage site status,” he added. Meanwhile, Teong Hum Yem, 65, said he was considering moving out of the heritage zone as the new rental was a burden. “I have already paid for January’s rent, which is RM4,000, an increase of 292% from RM1,368. But the coming months will be tough for me,” he said. Teong said his grandparents had been doing business in Penang Road since the 1920s. “I believe the properties here are owned by investors from Hong Kong, who bought them up in 1960s for a shopping mall project. But for some reason, the project never took off. “Six months before Jan 1, we were given letters indicating that there will be a rental increase beginning this year. Some moved out before the deadline while others, only recently,” he said. Sharon Saw said the family had been doing business selling apparels in Penang Road since the 1960s. She said her rental was now RM2,000, compared with RM700 before the increase. “We want to do business here, but we can’t afford the high rent. “Business here has been bad as tourists prefer to go for the local food rather than shop with us. This is why we can’t afford high rent. We can hardly go anywhere as the rent in the malls are also high. “We appeal to the state government to intervene,” she said. 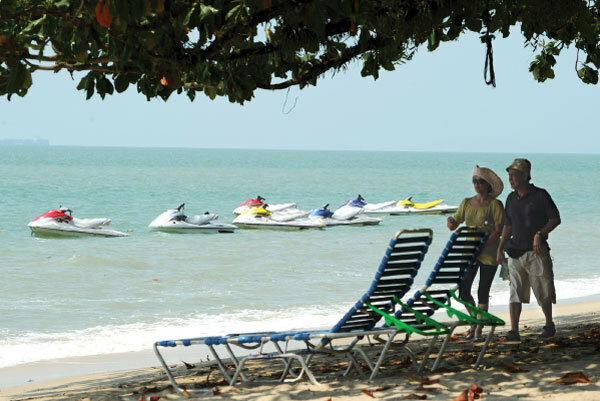 One of Penang’s most popular destinations (in fact, it’s the second most popular destination after Georgetown), Batu Feringghi consists of a long stretch of soft, white sandy beach along a winding road named Jalan Batu Feringghi, filled with a host of accommodation and dining options. Its night market is quite legendary, while its waters are popular spots for a range of water sports activities such as parasailing and windsurfing. SAN FRANCISCO, Feb 19 — P Linear Technology Corporation, a US-company, has invested an additional RM2 billion in its Penang plant, said International Trade and Industry Minister, Datuk Seri Mustapa Mohamed. An advanced integrated circuit manufacturer, Linear Technology, owns Linear Semiconductor Sdn Bhd. This is a big success for the Malaysian business ecosystem, he told Malaysian journalists here yesterday. “It is a great recognition for Malaysia as the Silicon Valley of the East,” he said. However, he did not furnish further details of the additional investment put up by the American IT company. Mustapa was here to attend the US-ASEAN Summit in Sunnylands on Monday and Tuesday, the ASEAN Economic Ministers Roadshow organised by the United States government on Wednesday and yesterday, as well as a business seminar at San Jose in Silicon Valley today. He said American companies saw ASEAN as having great potential with the establishment of the ASEAN Economic Community, a truly single market and production base with freer movement of goods and services. CERTAIN roads in George Town will be closed today for the state Chinese New Year Celebration at the Esplanade in Penang. Tanjong MP Ng Wei Aik said Beach Street, Church Street, King Street, Penang Street and Union Street would be closed from 7pm followed by Light Street from 9pm. “The setup of the canopies will begin after the closure of the six streets. “The closure will continue until tomorrow where Jalan Padang Kota Lama and Armenian Street will also be closed from noon till midnight tomorrow. “Since Light Street is partially closed, traffic will be rerouted to Jalan Tun Syed Sheh Barakbah,” he said. “Hence, parking will not be allowed along there from 9pm today to midnight tomorrow to ease traffic flow there,” he told a press conference in Komtar. Ng added that more than 1,000 parking lots would be available for the public at several places including Union Street Multi-Storey Car Park, Fort Cornwallis, Beach Street Multi-Storey Car Park, Beach Street, King Street, Weld Quay and Downing Street. “From 6am to midnight, the CAT Free Shuttle Bus is available every 30 minutes from Prangin Mall to Chulia Street. “Those who want to avoid driving, they can use Grab, the online taxi service (formerly known as MyTeksi), by keying in the ‘PGCNY’ promo code to enjoy a RM8 discount,” he said. Ng urged the public to handle the animated decorative lightings in Esplanade with care as repairs were already needed even though they were set up barely two weeks ago. He said the staff held by the Sun Wukong character was damaged while another character’s decorative firecracker was missing. “The hand of one of the characters is also missing and at least 19 lanterns needed mending. We can only engage a local repairman to try fixing it as the sifu has gone back to China after the setup was completed,” he said. The public should handle the decorations with care when taking photos as the decorations will be up until Feb 22. Ng added that the decorations had proven to be very popular and visitors would flock to the area even until after midnight to take photos. It was reported that the decorations were put up for the first time as part of the state’s Chinese New Year celebrations. The decorative lightings including characters of the 12 Chinese Zodiac Animals, Monkey God (Sun Wukong) and a giant red Chinese character of the word chun (spring) as well as other festive characters were put up at cost of RM315,000. PENANG Sports Club (PSC) has again displayed their cricket prowess on the oval to add two more trophies on the shelf. Over the part two months, they have won the Saudagar Singh Challenge Trophy and the Super Sixes Cricket Challenge Trophy. In their own backyard, PSC ousted Universiti Teknologi Petronas (UTP) Ipoh by a comfortable 14 runs to clinch the Saugdagar Singh Challenge Trophy. The trophy was a prize which came with the Penang Cricket Association’s (PCA) 30 Overs League title. This feat was a relief since PSC came so close to winning the prestigious trophy after coming so close in 2014. That year, PSC were made to play the bridesmaid’s role by Albhukhary International University in Alor Setar, Kedah. PSC cricket captain Shahul Hameed did not hide his thrill at this latest success. The string of victories started last year when they defeated their archrival Royal Bangkok Sports Club to grab the Elephant Trophy and Hayaty Nana Trophy in the annual inter-port clash, a tournament which had been on going for more than 80 years. “With double honours at the end of last year and back-to-back honours to kickstart 2016, we are on song. “I hope our streak will continue in this month’s PCA T-20 challenge and the Phuket Super Sixes tournament in Thailand this April,” he said. Shahul added that his current squad was built around foreign players from Pakistan, Bangladesh, India and Sri Lanka. They are not only PSC members but also cricket lovers willing to work hard to prepare for each tournament. This year’s PCA 30 Overs League Challenge attracted four teams besides PSC – Universiti Sains Malaysia, UTP Ipoh, the Australian Defence Forces and the Penang State Development Team. UTP Ipoh and PSC confirmed their place in the final but it was experience which gave PSC the edge. UTP Ipoh, a side built around students from Bangladesh and Pakistan, won the toss and they sent PSC to open their final campaign by batting first. PSC powered their way to 180 runs in 30 overs for a loss of eight wickets, with Venkat Raman emerging as their top scorer by contributing 56 runs in the process. Hammad Khakwani, UTP’s best bowler, might have captured four wickets for 13 runs in six overs in the first inning but this still failed to stop PSC from trooping out with a comfortable lead. That left UTP with the daunting task of chasing 181 runs in the second inning. Even when Mohd Tahir scored with 56 runs when they took to the bats, PSC merely tightened their grip and restricted the Ipoh lads to just a 166-run reply to confirm their victory.